A Chicago attorney, who has filed 20 lawsuits nationwide on behalf of women who have experienced serious side effects from breast implants, says he will file 25 more involving women from Florida to Alaska, including seven in Illinois. Kenneth Moll, of the McDowell and Colantoni law firm, said his 50 clients include women who have had implant surgery to correct the shape or symmetry of their breasts as well as those who have lost a breast due to cancer and have used the implants for reconstructive reasons. The physical problems they have experienced include severe fatigue, joint pain, hair loss, acne and muscle pain. Some have been diagnosed with chronic fatigue syndrome, arthritis or connective tissue disease, which some reports of rheumatologists have linked to leakage of the silicone gel implants, Moll said. On Monday, the Food and Drug Administration told doctors to stop inserting silicone gel breast implants and suppliers to stop providing them due to new concerns about their safety. 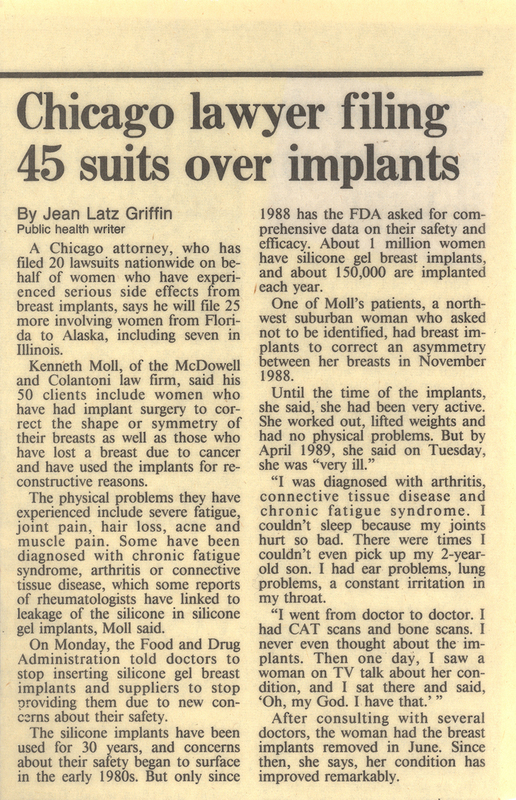 The silicone implants have been used for 30 years, and concerns about their safety began to surface in the early 1980s. But only since 1988 has the FDA asked for comprehensive data on their safety and efficacy. About 1 million women have silicone gel breast implants, and about 150,000 are implanted each year. One of Moll's patients, a northwest surburban woman who asked not to be identified, had breast implants to correct the asymmetry between her breasts in November 1988. Until the time of the implants, she said, she had been very active. She worked out, lifted weights and had no physical problems. But by April 1989, she said on Tuesday, she was "very ill."
"I was diagnosed with arthritis, connective tissue disease and chronic fatigue syndrome. I couldn't sleep because my joints hurt so bad. There were times I couldn't even pick up my 2-year-old son. I had ear problems, lung problems, a constant irritation in my throat. "I went from doctor to doctor. I had CAT scans and bone scans. I never even thought about the implants. Then one day, I saw a woman on TV talk about her condition, and I sat there and said, 'Oh my God. I have that.'" After consulting with several doctors, the woman had the breast implants removed in June. Since then, she says, her condition has improved remarkably.